Having an understanding of the type of chemical that you are using to treat sheep lice and following a correct application process will increase the effectiveness of your sheep lice treatment program. With increasing issues of resistance, it is even more important that chemicals are used in accordance to directions and rotated between years, as each time resistance occurs; this reduces control options. Chemicals alone are also not the answer. General flock management still needs to be adhered to for effective sheep lice control. Applying chemical costs time and money, so ensure this investment delivers the outcomes you are looking for. Producers need to be aware that resistance has been detected in Synthetic Pyrethroid and Insect Growth Regulator chemical groups. Chemicals from these groups should not be used when attempting to eradicate lice. It is recommended that chemical groups are rotated between years to reduce the development of resistance. Treated sheep must be kept separate from untreated sheep in all cases. None of the chemical groups claim to be effective when untreated sheep remain or are consequently mixed with treated sheep. Shearing is the only time each year that lice can be eradicated from your flock. Lice numbers are at their lowest following shearing and this is the easiest and cheapest time to get effective chemical to the remaining lice. Shower dips are not recommended for eradication. They are too difficult to get right. Long wool treatments will not eradicate lice but only control the lice population until shearing. Plunge dipping is the best application method for eradication of sheep lice because it ensures total saturation of the fleece, if done correctly. Fixed on farm plunge dips, (tested for chemical residues) portable plunge dips and portable cage plunge dips all qualify as plunge dipping options. The dip should be deep enough for sheep to be completely submerged and long enough (9 metres) to allow time for sheep to become completely wet so that all lice are treated. Lice can occur on the head so it is important that each sheep is dunked twice. Some compounds used for dipping are subject to ‘stripping’. This is when the dipping active is removed or ‘stripped’ from the dip at a faster rate than dip wash, leaving a lower concentration of active compound. With products which strip, it is important that reinforcement and topping up instructions on the label are followed to maintain adequate concentrations of lousicide in the dip wash. This is the most commonly used method of treating sheep lice due to convenience. It is essential that every sheep is treated effectively for eradication to occur and to reduce the development of resistance to the product. Correct dosing is essential. Under dosing is the major cause of failure to eradicate lice. Read the label to determine the correct dose. Make sure the chemical is applied from the poll all the way to the tail. Some products require one band down the centreline BUT other products require two full bands to be applied either side of the centreline. READ THE LABEL. Ensure sheep are cleanly shorn all over. Backline treatments do not work effectively on sheep not closely shorn or with lumpy wool. These sheep need to be dipped or culled. Check the label for rain fastness of the chemical. The principles of effective flock management are just as crucial as getting the chemical part right. Ensure fencing is stock-proof. This includes both boundary and internal fencing. Stock proof fences are essential to prevent re-infestation from outside sources. Monitor all mobs following treatment to ensure treatment was successful. Monitor for signs of lice control failure so that the appropriate action (if required) can be taken. Quarantine introduced sheep (including purchased rams & returned strays) until it is certain they are free of lice, and/or consider a long wool treatment. Finding no lice is no guarantee that they are lice free! 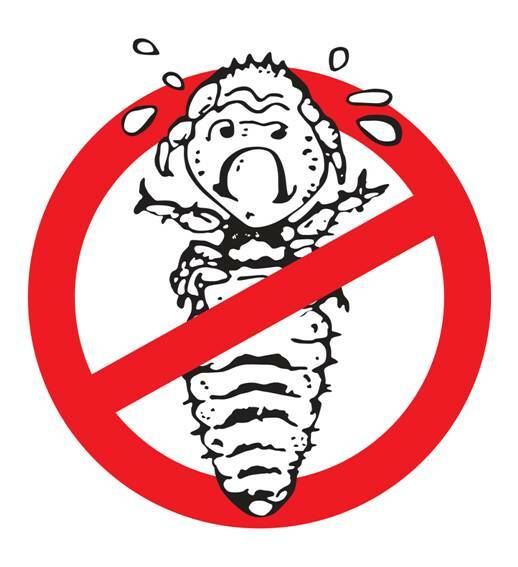 Above all, have a lice eradication plan, seek advice, treat effectively with an effective chemical, communicate with your neighbours and work together - form a local lice action group. Effective treatment of lice will not just happen. You have to make it happen! This information on effective lice treatment has been funded through the Sheep Industry Fund. Producers interested in seeking further information on establishing a Lice Action Group, contact Bruce Hancock, Rural Solutions SA, 0417 813 545.